-- U.S. President Barack Obama, in an August 4 Presidential Study Directive on Mass Atrocities. With an aim toward better U.S. preparation against and prevention of such tragedies, Obama ordered the establishment before year's end of an Atrocities Prevention Board, which is to receive support by an interagency study, the latter to be headed by the Office of the National Security Advisor. Obama explicitly instructed that this study consider recommendations of the Genocide Prevention Task Force, an effort cosponsored by the U.S. Holocaust Memorial Museum, the American Academy of Diplomacy, and the U.S. Institute of Peace and co-chaired by former Secretary of State Madeleine K. Albright and former Secretary of Defense William S. Cohen. 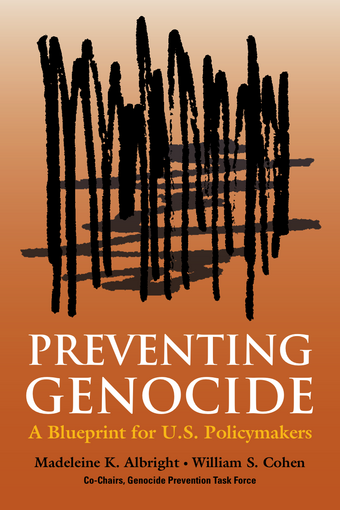 (credit for image above of task force's 2008 report) Also of relevance, of course, will be the compilation of genocide prevention norms about which IntLawGrrl alumna Felice Gaer has posted.